Objective To estimate the risk of death or severe harm due to bone cement implantation syndrome (BCIS) among patients undergoing hip hemiarthroplasty for fractured neck of femur. Setting Hospitals providing secondary and tertiary care throughout the National Health Service (NHS) in England and Wales. Participants Cases reported to the National Reporting and Learning System (NRLS) in which the reporter clearly describes severe acute patient deterioration associated with cement use in hip hemiarthroplasty for fractured neck of femur (assessed independently by two reviewers). 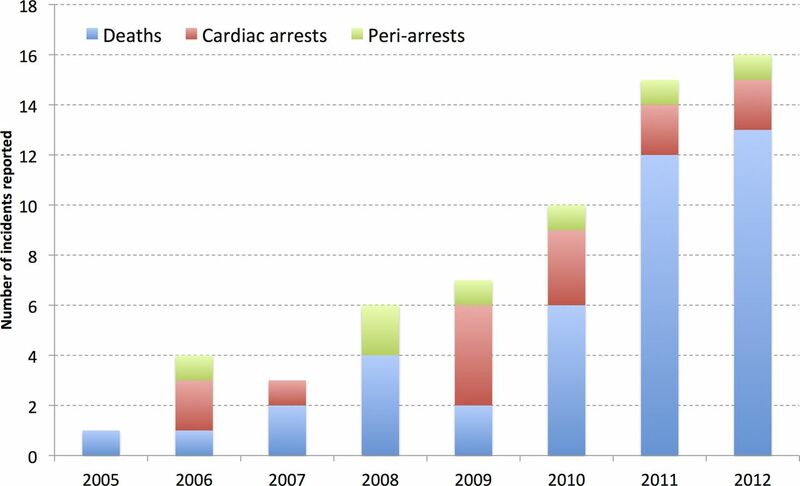 Outcome measures Primary—number of reported deaths, cardiac arrests and periarrests per year. Secondary—timing of deterioration and outcome in relation to cement insertion. Results Between 2005 and 2012, the NRLS received 62 reports that clearly describe death or severe harm associated with the use of cement in hip hemiarthroplasty for fractured neck of femur. There was one such incident for every 2900 hemiarthroplasties for fractured neck of femur during the period. Of the 62 reports, 41 patients died, 14 were resuscitated from cardiac arrest and 7 from periarrest. Most reports (55/62, 89%) describe acute deterioration occurring during or within a few minutes of cement insertion. The vast majority of deaths (33/41, 80%) occurred on the operating table. Conclusions These reports provide narrative evidence from England and Wales that cement use in hip hemiarthroplasty for fractured neck of femur is associated with instances of perioperative death or severe harm consistent with BCIS. In 2009, the National Patient Safety Agency publicised this issue and encouraged the use of mitigation measures. Three-quarters of the deaths in this study have occurred since that alert, suggesting incomplete implementation or effectiveness of those mitigation measures. There is a need for stronger evidence that weighs the risks and benefits of cement in hip hemiarthroplasty for fractured neck of femur. The National Reporting and Learning System (NRLS) receives data from a health service serving 56 million people, so it is able to detect patterns of rare but serious harm not apparent to individual practitioners or even within formal trials. Reports to the NRLS provide narrative accounts of bone cement implantation syndrome (BCIS) from first-hand witnesses, adding to the weight of evidence that this condition exists and is causing death and severe harm. The NRLS suffers from under-reporting, so an estimate of BCIS incidence derived from it is probably an underestimate and the magnitude of this effect is difficult to assess. The NRLS is not designed to completely assess the benefits and risks of a treatment and its alternatives, so this study's findings must be considered in conjunction with other sources that provide information on benefits associated with cement use, and on all-cause mortality associated with cemented and uncemented hip hemiarthroplasty. In 2003, the National Health Service (NHS) in England and Wales established a patient safety incident reporting system, called the National Reporting and Learning System (NRLS).4 It was designed and initially managed by an independent agency—the National Patient Safety Agency (NPSA). Staff throughout the NHS were, and still are, encouraged to report any unintended or unexpected incident that led to patient harm, or could have done so.5 Nine million reports have been received until now,6 making the NRLS the largest repository of patient safety incidents in the world. Measures to mitigate risk of bone cement implantation syndrome advised by the National Patient Safety Agency 2009 alert. Since the national alert was issued, a number of research reports, mostly meta-analyses of randomised controlled trials (RCTs), have suggested that there is no net increased risk from cement.11–14 However, increasing numbers of patient safety incident reports from the NHS have continued to give stark accounts of the proximity of cement insertion in hip operations to sudden death. The NRLS is a unique repository of such information. In this study, we examine the series of incident reports made to the NRLS on this topic and consider the implications for clinical policy and patient safety. We searched the NRLS database for reports made between 1 January 2005 and 31 December 2012, in which the free-text field contained: ‘cement’ OR ((‘death on operating table’ or ‘death on table’ or ‘died on operating table’ or ‘intraoperative death’ or ‘cardiac arrest’ or ‘desaturation’ or ‘hypotension’ or ‘fat embolus’ or ‘fat embolism’ or ‘collapse’) AND (‘orthopaedic surgery’ or ‘orthopaedic operation’ or ‘hip surgery’ or ‘hip operation’ or ‘hip replacement’ or ‘arthroplasty’ or ‘hemiarthroplasty’ or ‘intramedullary’)). This search was applied to reports classified as ‘death’, ‘severe harm’ or ‘moderate harm’ (the latter was included because there are instances of death being mistakenly reported as ‘moderate harm’, for example). Data collected during the first year of operation of the NRLS (2004) are not used because this is regarded as a development phase. Two researchers (PDR and SSP) independently assessed the free-text descriptions provided within retrieved reports. Each reviewer assessed whether or not the report described, as its primary purpose, an acute patient deterioration (immediately leading to death or not) during or shortly after the insertion of cement in hip hemiarthroplasty for fractured neck of femur. Inter-rater agreement between reviewers was calculated, and differences were resolved through arbitration by a third reviewer (LJD). Further data were extracted from each included report: year of report, operation type, indication for surgery, patient age, outcome (death, cardiac arrest or periarrest). In addition, the timing of both the acute deterioration and the outcome were separately categorised based on the information provided in the free-text description. If any description suggested an alternative or major contributing cause of death, this was recorded. Each report was also categorised as a ‘pre-NPSA alert’ (1 January 2005 to 14 September 2009) or a ‘post-NPSA alert’ (15 September 2009 to 31 December 2012). The cut-off date, 14 September 2009, was the implementation deadline for the NPSA alert. Data were recorded in Microsoft Excel 2011 and analysed in Stata V.12. Significance tests are two-tailed. This study was part of a research programme funded at Imperial College by NHS England to develop incident reporting in the NHS. A total of 360 reports met the search criteria and were examined in detail. Of these, 62 were judged by the reviewers to describe death or severe harm associated, in the description provided by the reporter, with the use of cement in hip hemiarthroplasty for fractured neck of femur. Two-thirds of these (41/62, 66%) described deaths. A further 14 described cardiac arrests from which the patient was resuscitated, and another seven described periarrest situations from which the patient recovered. Inter-rater agreement was very high (k=0.962, p<0.0001). The number of such reports generally increased year on year during the period (figure 2). Deaths, cardiac arrests and periarrests related to hip cement among patient safety incident reports in England and Wales, 2005–2012. A further 39 reports described death or severe harm associated with the use of cement in a different hip operation (n=12), or in a hip operation in which the operation type or indication (or both) was not stated in the report (n=27). The sensitive search strategy also yielded 259 reports that were discarded because they did not describe death or severe harm associated with the use of cement in any hip operation. Most described minor errors associated with the preparation and use of cement, such as unavailability of cement or poor knowledge of cement preparation. Others related to hip surgery but not to cement, or to surgery involving other joints. The most common descriptions were that the acute deterioration occurred ‘during cement insertion’ (24/62, 39%, table 1) or ‘after cement insertion’ (16/62, 26%). Including these, the great majority of descriptions (55/62, 89%) suggested that deterioration occurred within approximately 3 min of cementation (‘shortly after’ in six cases, ‘during prosthesis insertion’ in two cases, ‘within 1 min’ in three cases and ‘within 2–3 min’ in four cases). In the remainder, the deterioration occurred later but before the end of the operation. A representative sample of anonymised descriptions is provided in figure 3. Examples of extracts from included patient safety incident reports. All of the reported cardiac arrests and periarrests occurred immediately, on the operating table. The majority of the deaths (33/41, 80%) also occurred on the table. In the remainder, the acute deterioration started as described above, but the patient did not die until later. The reports referred to patients aged between 66 and 100 years. The median age was 88 and the mean 87 (SD 7 years). Mean age did not differ significantly by outcome (87.4 years among deaths, 84.5 years among cardiac arrests, 88.5 years among periarrests, χ2=1.722, p=0.423). Nearly three times as many reports were made in the 39.5 months after the NPSA alert was issued than in the 56.5 months before it (46 vs 16, table 2). The increase in reports was more marked for deaths (3.6-fold) than for cardiac arrests (2.4-fold) and periarrests (1.3-fold). In addition to the 62 cases already described, 39 other reports also clearly described deterioration leading to death, cardiac arrest or periarrest associated with cement use during a hip operation. These were not included in the main analysis because they did not state that the operation described was hemiarthroplasty for fractured neck of femur. In just under one-third of these reports (12/39, 31%), the operation was clearly not a hemiarthroplasty (three total hip replacements for fractured neck of femur, five total hip replacements with no indication given, four non-arthroplasty hip operations). The majority (27/39, 69%), however, were not included but might have related to hemiarthroplasty for fractured neck of femur. In 11 reports, the operation was not stated but the indication was stated as fractured neck of femur. In the other 16 reports, neither the operation nor the indication was specified (except to describe a hip operation involving cement). If some or all of these 27 reports were in fact of hemiarthroplasties for fractured neck of femur, this would increase the count reported in this paper from 62 cases potentially up to 89, an increase of up to 44%. This paper presents a series of 62 cases of deaths or severe harm associated, in reports to the NRLS, with the use of cement during hip surgery. These occurred in England and Wales between 2005 and 2012. Among these there were 41 deaths, 14 patients who suffered a cardiac arrest but survived, and 7 who suffered a periarrest but survived. With a total of 180 000 hemiarthroplasties for fractured neck of femur carried out in this period, one report of death or serious harm was received for every 2900 cases. The value of this paper derives from the major strength of the NRLS—that it receives reports of adverse events from across a health service serving 56 million people. The NRLS can therefore detect patterns of rare but serious harm that may not be apparent to individual practitioners or hospitals, or indeed within formal trials. Most reports contain a free-text description of the incident. We are therefore able to present a series of cases highly suggestive of BCIS, with the compelling descriptions provided by first-hand witnesses adding to the weight of evidence that, though its incidence is rare, this condition exists and is causing instances of death and severe harm. This study has two main weaknesses. First, the NRLS suffers from under-reporting. The number of cases of BCIS presented here probably under-represents its true incidence, and the magnitude of this effect is difficult to assess. Second, the NRLS is not designed to offer a complete assessment of the benefits and risks of a treatment and its alternatives. Our findings need to be considered in conjunction with other sources that can provide information on the benefits associated with cement, and on all-cause mortality associated with cemented and uncemented surgery. The accumulation of these reports earlier led to considerable concern at the NPSA, which in 2009 issued an alert to the NHS about the issue. This alert advised anaesthetic and surgical measures to mitigate the risk of BCIS, rather than advising that cement should not be used. This was despite the fact that uncemented prostheses are the norm in some countries, and also because there was a lack of professional consensus in England and Wales on the research evidence of risk and on the size of the problem. Since the NPSA alert was issued, a number of meta-analyses have pooled RCT data to compare mortality between cemented and uncemented hemiarthroplasty in the treatment of hip fracture.11–14 These meta-analyses are severely limited by their small size. By our calculation, even the largest of them,12 with data from just 1175 participants, only had sufficient statistical power to detect a mortality difference if hip cement was causing one additional death for every 25 patients treated (based on standard power calculation variables α=0.1 and β=0.8, and mortality among the uncemented group of 6%). To detect even a difference of 1 additional death per 100 patients would require a 15 000 participant study. It should therefore come as no surprise that none of these meta-analyses has found a statistically significant mortality difference, but this does not demonstrate that there is no clinically significant difference. In our view, these studies have been widely taken to be more conclusive than they actually are. A number of countries have well-established joint replacement registries. Their substantial size makes these a potentially useful source of data to address questions such as this. However, the National Joint Registry for England, Wales and Northern Ireland17 collects data on total hip replacement only, not on the hemiarthroplasties with which most of the deaths described here are associated. Analysis of 25 000 hemiarthroplasties recorded in the Australian registry found that cement use was associated with a higher mortality rate at 1 day postoperatively, but the reverse was found at 1 week, 1 month and 1 year.18 Conversely, an analysis of the UK National Hip Fracture Database found use of cement to be associated with a small but significant adjusted survival benefit (adjusted OR 0.83, 95% CI 0.72 to 0.96).19 This was based on data from 16 496 cases in 129 hospitals over the course of a year. It captures all causes of in-hospital mortality, and the result is adjusted for gender, age, type of surgery and ability to walk outdoors unaccompanied. However, the authors admit ‘concern about the “completeness” of the data submitted to the database: the figures are improving, but few hospitals submit data on all their patients with a fracture of the proximal femur’. In such circumstances, it seems very reasonable to suppose that patients who die intraoperatively might be less likely to have their data submitted than patients who do not. If so, this bias means that cases of BCIS-related death may have been missed and the risks associated with cement use underestimated. The most recent registry-based analysis comes from Norway.20 Based on 11 000 patients, it finds cement use to be associated with a substantially higher mortality rate within the first day postoperatively—1 additional death per 116 operations among cemented than uncemented arthroplasties. This analysis is able to adjust for underlying differences between groups, but it suffers from some degree of missing data. The registries are likely to provide further valuable information on this question, but because they allow observational, rather than randomised, studies, it will be vital to remove potential reporting biases and to collect sufficient information to allow for case-mix adjustment. The patient safety incident reports detailed in this paper are compelling, representing eyewitness accounts of instances in which bone cement seems to have caused death or severe harm. The NRLS and patient reporting systems, in general, are relatively new. Such systems offer a unique source of learning from errors at the local, national or international level.21 There is no consensus about how their data should be weighed alongside established sources. For example, the current National Institute for Health and Clinical Excellence (NICE) hip fracture guideline22 cites the small meta-analyses and RCTs referred to above, states that there is no evidence of mortality difference, and so recommends the use of cement. It takes no account of NRLS data, or indeed of registry-based studies. Patient safety incident reports tend to be undervalued, mainly because there is under-reporting, but this is only likely to underestimate the extent of a problem, not to overstate it. Such reporting systems may by the only source powerful enough to pick up a ‘signal’ when there is a rare cause of harm. Even allowing for under-reporting, the data presented here suggest that BCIS is a rare event. It might well be the case that cement provides a benefit to patients that outweighs the harm of BCIS. For example, individual studies have associated uncemented hip hemiarthroplasty with a greater number of mechanical complications23 and reoperations,24 and a decline in this technique has been noticed in some countries.25 However, it is not straightforward to assert that cement provides greater benefit than uncemented replacement. The considerable international variation in the use of cement illustrates this uncertainty. The recent NICE guideline on hip fracture finds that the evidence on this question is of low or moderate quality. It concludes that cement use has a statistically significant benefit in terms of mobility and pain, but that the scale of this benefit is not clinically significant. This study suggests that BCIS continues to cause rare instances of death and severe harm in emergency hip hemiarthroplasty surgery in England and Wales, despite a 2009 national alert that advised on best practice measures to mitigate this risk. This study should serve to reinforce the importance of taking the anaesthetic and surgical measures known to mitigate the risk of BCIS. More generally, this study demonstrates the value of patient safety incident reports in examining causes of harm that may not be detected even by studies high within the hierarchy of traditional research evidence. There is a need for more work on how data from studies such as this one should be considered in tandem with the findings of more traditional studies to optimally answer complex patient safety questions. National Hip Fracture Database. National Report 2013. http://www.nhfd.co.uk/003/hipfractureR.nsf/resourceDisplay?openform (accessed 21 Nov 2013).
. To cement or not in hip fracture surgery? Lancet 2009;374:1047–9. British Orthopaedic Association. The care of patients with fragility fractures. (Guideline Ref ID: BOA2007). 2007.
. The development of the national reporting and learning system in England and Wales, 2001–2005. Med J Aust 2006;184:S65. NHS National Reporting and Learning System. About reporting patient safety incidents. http://www.nrls.npsa.nhs.uk/report-a-patient-safety-incident/about-reporting-patient-safety-incidents (accessed 21 Nov 2013). NHS National Reporting and Learning System. NRLS quarterly data workbook up to December 2012. http://www.nrls.nhs.uk/resources/collections/quarterly-data-summaries/?entryid45=135213 (accessed 21 Nov 2013). National Patient Safety Agency. Mitigating surgical risk in patients undergoing hip arthroplasty for fractures of the proximal femur. National Patient Safety Report; 2009, NPSA/2009/RRR001. ttp://www.nrls.npsa.nhs.uk/resources/?EntryId45=59867 (accessed 21 Nov 2013).
. Bone cement implantation syndrome. Br J Anaesth 2009;102:12–22.
. Endogenous cannabinoids are candidates for lipid mediators of bone cement implantation syndrome. Shock 2004;21:8–12.
. Mitigating surgical risk in patients undergoing hip arthroplasty for fractures of the proximal femur. J Bone Joint Surg 2009;91-B:851–4.
. Cemented versus uncemented hemiarthroplasty for hip fractures: a systematic review of randomised controlled trials. Hip Int 2001;21:509–17.
. Systematic review of cemented versus uncemented hemiarthroplasty for displaced femoral neck fractures in older patients. Arch Orthop Trauma Surg 2012;132:455–63.
. Cemented versus uncemented hemiarthroplasty for femoral neck fractures in elderly patients: a meta-analysis. PLoS ONE 2013;8:e68903.
. Arthroplasties (with and without bone cement) for proximal femoral fractures in adults. Cochrane Database Syst Rev 2010;6:CD001706. National Patient Safety Agency. What is a patient safety incident? http://www.npsa.nhs.uk/nrls/reporting/what-is-a-patient-safety-incident (accessed 29 Nov 2013).
. Laparoscopic cholecystectomy: device-related errors revealed through a national database. Expert Rev Med Devices 2011;8:555–60. National Joint Registry for England, Wales and Northern Ireland. 10th Annual Report 2013. http://www.njrcentre.org.uk/njrcentre/Reports,PublicationsandMinutes/Annualreports/tabid/86/Default.aspx (accessed 21 Nov 2013).
. Perioperative mortality after hemiarthroplasty related to fixation method: a study based on the Australian Orthopaedic Association National Joint Replacement Registry. Acta Orthop 2011;82:275–81.
. Does cementing the femoral component increase the risk of peri-operative mortality for patients having replacement surgery for a fracture of the neck of femur? Data from the National Hip Fracture Database. J Bone Joint Surg 2011;93-B:1405–10.
. Perioperative mortality in hip fracture patients treated with cemented and uncemented hemiprosthesis: a register study of 11 210 patients. Int Orthop 2013;37:1135–40.
. A public health approach to patient safety reporting systems is urgently needed. J Patient Saf 2011;7:109–12. National Clinical Guideline Centre. The management of hip fracture in adults. London: National Clinical Guideline Centre, 2011. http://www.ncgc.ac.uk (accessed 21 Nov 2013).
. Cemented or uncemented hemiarthroplasty for the treatment of femoral neck fractures? Acta Orthop 2014;85:49–53.
. Higher risk of reoperation for bipolar and uncemented hemiarthroplasty. Acta Orthop 2012;83:459–66.
. Changes in implant choice and surgical technique for hemiarthroplasty. 21,346 procedures from the Swedish Hip Arthroplasty Register 2005–2009. Acta Orthop 2012;83:7–13.
. Reflections on the National Patient Safety Agency's database of medical errors. J R Soc Med 2009;102:256–8.
. An assessment of the quality and impact of NPSA medication safety outputs issued to the NHS in England and Wales. BMJ Qual Saf 2011;20:360–5.
. Need for expertise-based randomised controlled trials. BMJ 2005;330:88. Contributors Data analysis was undertaken by PDR and SSP. The paper was drafted by PDR and SSP and critically reviewed by AD and LJD. All authors contributed to the conception and design of this work. All authors approved the final version. Funding This study was part of a research programme funded at Imperial College by National Health Service (NHS) England to develop incident reporting in the NHS. Ethics approval This study was part of a research programme funded at Imperial College by NHS England to develop incident reporting in the NHS. Ethical approval is in place for this programme from the Health Research Authority.